Son of Thiadgrim and Liafburg, wealthy Frisian nobles. Brother of Saint Gerburgis and Saint Hildegrin. Saw Saint Boniface preach in 753, and was greatly moved. Studied at Utrecht, Netherlands under Saint Gregory of Utrecht. Studied three and a half years in England under Blessed Alcuin. Deacon. Returned to the Netherlands in 773 as a missionary. Sent to Deventer in 775 to restore a chapel destroyed by pagan Saxons, and to recover the relics of Saint Lebwin, who had built the chapel. Taught school at Utrecht. Destroyed pagan idols and places of worship in the areas west of Lauwers Zee after they were Christianized. Ordained in 777 at Cologne, Germany. Missionary to Friesland, mainly around Ostergau and Dokkum, from 777 to 784, returning each fall to Utrecht to teach in the cathedral school. Left the area in 784 when pagan Saxons invaded and expelled all priests. Pilgrim to Rome, Italy in 785. Met with Pope Adrian I, and the two exchanged counsel. Lived as a Benedictine monk at Monte Cassino, Italy from 785 to 787, but did not take vows. At the request of Charlemagne, he returned to Friesland as a missionary. It was a successful expedition, and he built a monastery in Werden, Germany to serve as a base. Reported to have cured the blindness of, and thus caused the conversion of the blind pagan bard Berulef. Refused the bishopric of Trier, Germany in 793. Missionary to the Saxons. Built a monastery at Mimigernaford as the center of this missionary work, and served as its abbot. The word monasterium led to the current name of the city that grew up around the house - Münster. Built several small chapels throughout the region. First bishop of Münster in 804, being ordained at Westphalia. • on the day of his death, he celebrated Mass - twice. Her father and older sister died when Maddalena was 8 years old, and the girl had to work to help support her large family. She managed to work and study, and in 1866 she graduated as an elementary school teacher. She wanted to enter religious life, but her family needed her, and she worked for 12 years as a teacher in rural Montaldo, Italy teaching catechism in her parish. In 1878, having helped raise her siblings, and saved enough to insure her mother‘s future, Maddalena entered the Daughters of Mary, Help of Christians, the congregation founded six years earlier by Saint John Bosco. In 1881 she was sent to Trecastagni in the Diocese of Catania, Sicily, and took charge of an existing institute for women, inspiring it with Salesian principles. Sicily became her second home. She opened new houses, set up after-school activities and sewing classes, trained teachers, and taught catechism. She spent 25 years in Sicily, serving her community as local and provincial superior, guiding novices, and faithfully living the charism of Mother Maria Mazzarello, co-foundress of the institute. Godson of Saint Nivard of Rheims; student of Saint Remaclus of Maestricht. Monk at Luxeuil Abbey under the leadership of Saint Walbert. First abbot of Hautvillers Abbey; he expanded it and built other houses, one of which was populated by brothers who were redeemed slaves. First abbot of Montier-en-Der Abbey. Pilgrim to Rome, Italy and to the Holy Lands, bringing back relics for his houses. Venerated as a martyr as he died defending the principles of his religious order. Youngest of ten children born to Saint Basil the Elder and Saint Emmelia; brother of Saint Basil the Great, Saint Gregory of Nyssa, and Saint Macrina the Younger. His father died when Peter was an infant, and he was raised and educated by Saint Macrina. Monk in a monastery in Armenia on the Iris River, a house that had been founded by his parents and was headed by his brother Basil. Abbot of the house in 362. Worked to help people suffering in a famine in Pontus and Cappadocia. Ordained in 370. Bishop of Sebaste, Armenia in 380. Fought fiercely against Arianism in his see. Attended the General Council of Constantinople in 381. Hermit near Constantinople. Being a foreigner, and being odd in his appearance and behavior, he was arrested, questioned and tortured as a spy, but his gift of miracles and prophecy convinced his captors that he was just a holy man, and they freed him. Friend of Saint Theodora of Constantinople. He later publicly denouced the immorality of the area's aristocracy, including Princess Anastasia, which led to further persecution by the authorities. Sub-deacon in Alexandria, Egypt and leader of a group of Christians who supported Saint Athanasius of Alexandria and opposed Arianism. Arrested, scourged and condemned to slavery in the mines for adhering to orthodox Christianity. Martyr. Member of the French nobility and a courtier to King Theirry II. Married and a father. Retired to become a monk at Lonrey, France. After receiving a vision, he moved to become a hermit near Pistoia, Italy. 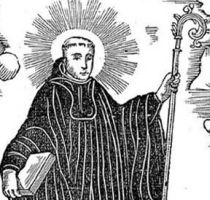 Friend of Saint Desiderius of Pistoia. 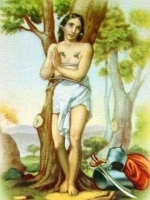 Married to and martyred with Saint Montanus the Martyr in the persecutions of Diocletian. Sixth century hermit who lived on the face of a cliff at Saint Govan's Head, Dyfed, Wales; his stone hut survives today, and attracts many visitors. Spiritual student of Saint Ailbe. Martyred with 42 companions in the persecutions of Diocletian. Bishop in Anatolia (in modern Turkey). Martyred with 42 companions in the persecutions of Diocletian. Priest. Married to and martyred with Saint Maxima the Martyr in the persecutions of Diocletian. Spiritual student of Saint Patrick. Founded the Killeigh monastery in Offaly, Ireland. Hermit at Pistoia, Italy. Friend of Saint Barontius of Pistoia. Martyred along with his wife, two sons and two daughters for their faith. Bishop of Trier, Germany in 386, consecrated by Saint Martin of Tours. Seventh century abbot at Dungarvan, Ireland. A group of Christians martyred together. The only details to survive are the names - Cassian, Jovinus, Marcian, Peter and Thecla.